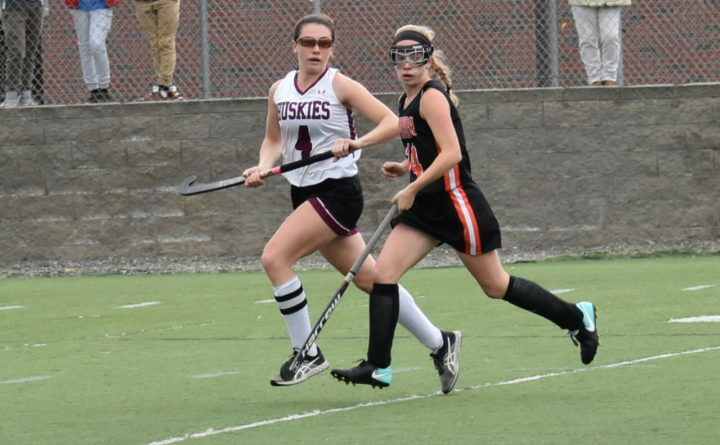 Addi Williams (left) of Maine Central Institute, pictured during the Class B North semifinal against Gardiner, scored three goals on Saturday to lead the Huskies to a 5-1 victory over York for the state championship. FALMOUTH, Maine — Maine Central Institute ended York’s three-year championship reign by defeating the Wildcats 5-0 in the Class B state title game at Falmouth High School on Saturday. “It’s such a surreal feeling,” senior Addi Williams said. Williams tallied three goals for the Huskies, including the game’s first score near the midway point of the first half. That was the only goal of the first half. Williams scored her second in the fifth minute of the second half. York had a couple chances on the same play a few minutes later, but MCI goalkeeper Elspeth Taylor made one stop, hit the ground, got up, and made the other stop. “We have confidence in her,” Williams said. “She’s phenomenal. Vivian Duncombe made it 3-0 with 19:15 to play, and the championship started to slip out of the Wildcats’ grasp. Williams’ third goal came with 15:34 remaining in the game. Allysah Green capped the scoring with 3:23 left. The Huskies were playing in their third consecutive state championship game, but the past two (a championship in 2015 and a runner-up to Oak Hill) came in Class C.
They have always played a Class B schedule, but Hughes said winning the Class B title is quite the feat.